PowerDirector 365 is a relatively new addition to CyberLink's stable of creative software, taking the popular video editing suite and making it available as a monthly or annual subscription service (similar to Adobe Creative Cloud). For $48.99/£41.99 (about AU$68) a year or $19.99/£17.99 (about AU$28) a month, you get the latest version of PowerDirector, plus regular updates that add new features that won't be available to non-subscribers until the next annual release. For comparison, a license for PowerDirector 17 Ultra costs $99.99/£79.99 (about AU$140), with no additional goodies added throughout the year. As a PowerDirector 365 subscriber, you also have access to a huge range of download packs, including special effects, titles, background music, and CyberLink's fun AI Style Packs. These can cost as much as $50/£40 (about AU$70) when bought separately, making the subscription even more appealing. As always one of the most appealing aspects of PowerDirector is its flexibility, and the software offers a choice of interfaces. As with the previous version of the software, you can take your pick from Timeline Mode, Storyboard Mode and Slideshow Creator, with additional options for creating a video in a couple of clicks with Auto Mode, plus a 360-degree video editor. Whatever your level of experience, and however simple or complex your needs, there’s something here to suit you. The most interesting effects are to be found in Timeline Mode. This will look instantly familiar if you’ve used premium video editing software like Adobe Premiere Pro or Apple Final Cut Pro, presenting you with a series of audio and video tracks where you can drag and drop different elements to create your video. Editing is non-destructive, so none of your original files will be changed after you import them and start experimenting. One of the new additions in the CyberLink PowerDirector 365's latest update is a library playback window, which lets you see a video clip from your library alongside a preview of your project. It's a very handy feature that lets you see the impact of your edits at a glance, and you can find it by opening the View menu and selecting ‘Library playback window’. Effects and titles now snap to align with objects on the timeline as well, which is a real time-saver, there's improved support for dual screens (you won't lose your settings if you disconnect then reconnect a second monitor), and there's more flexibility when to comes to setting up hotkeys. As mentioned, when you subscribe to PowerDirector 365, you'll also receive free access to CyberLink's collection of plug-ins and effects. These include AI style plugins, which take the style of a particular artwork and apply it to your video (or a section of it). Some of these are provided with the regular version of PowerDirector 17, but others won't be available until version 18 rolls around. AI style plugins aren't just filters that change the colors - AI style plugins analyze the content of your video and replicate the brush strokes or pencil lines or your chosen artwork. Some are better suited than others to particular subjects, so it might take a little experimentation to find a look that works for your particular video, but the results can be very impressive. It's worth bearing in mind that AI style plugins aren't a good option if you're short of time; their complexity means they'll probably take several minutes to apply, even on a relatively powerful PC. If you have the time, however, the finished effect it worth the wait. Our only complaint is that when you select (for example) the Video Overlay Room from the links on the left, clicking 'More premium effects' doesn't take you to the handy application manager, which lets you see and download all the available options. Instead, it directs you to webpage describing them. A minor quibble, but it can be frustrating. You'll also occasionally see promotions advertising the features of PowerDirector 365 (while your video is being produced, for example), even though you're already using it. 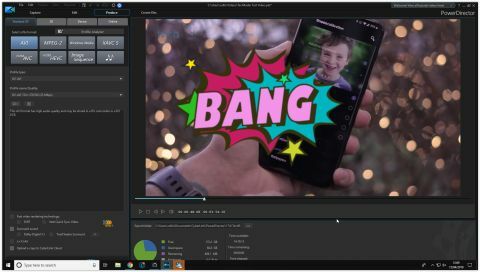 If you're looking for a quicker way to make your videos look amazing, PowerDirector's Magic Movie Wizard is still there, ready to transform your video clips and photos into impressive productions with as few clicks as possible. It's worth noting that PowerDirector 365 isn't the only subscription available. If you subscribe to CyberLink Director Suite 365, you'll get PowerDirector, as well as PhotoDirector, AudioDirector and ColorDirector for a single monthly or annual fee. You can move files between the four programs seamlessly (which is particularly helpful for AudioDirector, ColorDirector and PowerDirector), and the combined subscription price is the same a perpetual license to PowerDirector alone. Whatever your level of experience, CyberLink PowerDirector offers something for you, and it can grow with you as you become more proficient and want to take on more challenging projects. The 365 subscription is the most affordable way to get started with the software; signing up for one month will give you a good idea of whether it's the right tool for you, and a whole year still costs considerably less than a perpetual license. Regular feature updates and extra content packs sweeten the deal even further, making PowerDirector 365 one of the best value and most flexible home video editors around.